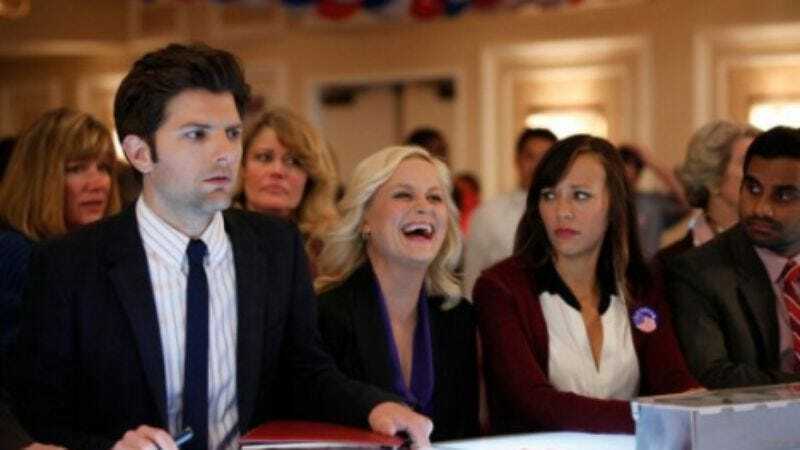 Fresh off of last night's season finale, here's another reason to deliver a heartfelt speech and then get sloppy drunk with your co-workers: NBC has issued a fifth-season renewal for Parks And Recreation, giving it the same 13-episode order that both 30 Rock and Community picked up yesterday. According to HitFix's Alan Sepinwall, however, the possible good news is that the show is scheduled to debut in the fall, which means there's a chance that it will receive an order for the proverbial "back nine" and keep right on going for the several more seasons that it so richly deserves. And as Todd pointed out in his Community update yesterday, much of that could have to do with whether it out-performs many of those new comedies NBC has been slapping on its schedule in an effort to completely overhaul itself, or at least continues to pull in the same stalwart numbers while America violently rejects Josh Gad like a baboon heart. Speaking of those newer sitcoms, Up All Night has also gotten the go-ahead for a second season, while Deadline notes that there is "talk" about also giving Whitney another go, most likely of the mumbling, defeated, sigh-laden variety. A renewal for The Office—though called simply a "formality" yesterday—is still not a done deal, but you can probably expect word on that imminently. UPDATE: Actually, Sepinwall has now revised his earlier statement: NBC has decided that Parks will just get the full 22-episode order, so no need to worry about it besting Gad or anyone else. In other update news that is notably less thrilling, the network has officially ordered another season of Whitney. The nation will soon be filled with the sound of applauding labia.